I provide boarding in my home at a rate of $45 per day per dog. I do not require vaccines other than rabies, by law. Thank you for your interest in allowing my wife, Diana, and I to provide care for your organization’s animals. The following are the criteria for placement into our home. But first a little bit about our environment. We foster/board dogs in our home. We have an attached garage where we have four kennels set up for the dogs. Therefore, any dog coming into our home must crate-able. The garage leads directly into our large fenced yard. We also have a path throughout our 2.5 acres of property were we take the dogs for a stroll. Our dead end, cul de sac also offers a one mile loop where we can safely and privately walk the dogs. And, we offer pack walks for the local community here and often bring our foster dogs on pack walks – provided they are behaviorally equipped to handle such a social situation. Although the dogs in our care are kenneled they get out in the yard and/or walks 5-7 times a day starting around 7am with the last biological relief being around 11pm. We provide soothing music and the use of essential oils to maximize their mental state. We provide daily training and structure. Once they reach a level of stability, we expose them to the interior of our home to ensure they can acclimate to domestic life. Training consists of the use of all schedules of reinforcement, depending on the needs and capacity of each dog to respond to certain protocols. I also use correction tools like gentle leaders, pinch collars, martingales, no-pull harnesses, loop leads, etc (I do not use choke chains). I also provide Reiki treatments to all dogs in our care to further assist them in achieving behavioral balance. We also always have dogs here that can assist us in socializing “clients” around other animals. As you know, some dogs may never like other dogs. But, it is our belief that they must at least be able to coexist in the presence of other animals. We provide you with updates regularly, including an initial intake video, recurring progress video and training logs for your review. If you have any questions that have not been answered or covered above, please let me know. Although we do and can, we currently cannot take in any human aggressive dogs. Our non-personal pet limit is 4 dogs. 2 spots are reserved for boarding clients. Dogs must be crate-able. No exceptions. 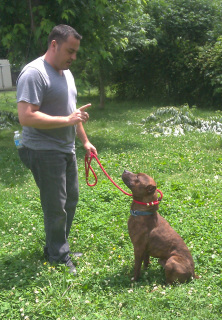 Any dog we are considering for intake may be subject to an evaluation by me (Jeff) PRIOR to us committing to that dog. Prior assessments and video may be accepted in lieu of. Due to the size of our kennels (5’x5’), we have a 100lb weight limit at this time. Bait dogs welcome, especially those that require assistance in gaining trust and confidence in humans. Prices may be subject to change based on a dog’s actual behavior in our environment. We reserve the right to discontinue service on a dog at any time, for any reason. If this clause is implemented, we do offer a partial refund based on the time remaining. We do not provide a refund for work or boarding/training services already rendered. We have an open door policy and you are welcome to visit our home/your animal at any time. Each organization is required to provide food and vet care for their animals in our care. Animals must not have any communicable diseases as we do NOT have quarantine capability in our home. All dogs must be up to date on vaccines and vet care. Payment Option for dog owners/rescues. This transaction is for the purpose of reserving a kennel for dog boarding and training for a 4 week period. The full cost of this service is $3500. A 50% non-refundable deposit is required prior to training period. Included with this deposit are some downloadable tip sheets and information for your review. This transaction is for the purpose of reserving a kennel for dog boarding and training for a 4 week period. The full cost of this service is $3500 per month or $150 per day. A 50% non-refundable deposit is required prior to training period. Included with this deposit are some downloadable tip sheets and information for your review. This purchase is exclusively for 501(c)(3) animal rescues. Such rescues receive special pricing. A 4% surcharge ($32) is added on to cover credit card andprocessing fees. If you have not received your contract already, you can download immediately upon payment - the PDF is attached.